The orchid kingdom differs from other plant families in that many orchid genera are able to breed with other orchid genera to form what are known as intergeneric hybrids. Cattleya was one of the first orchid genera to be recognised as being capable of forming hybrids with other genera, in particular with Laelia, to give rise to the genus Laeliocattleya (abbreviated Lc. and first described by R.A. Rolfe in 1888). Hybrids with many other related genera, such as Sophronitis, Schomburgkia, Brassavola (Rhyncholaelia), Epidendrum, Leptotes, Diacrium and Broughtonia, have since been made. 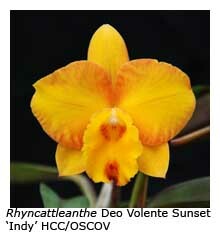 Collectively they are described in the OSCOV Judging Handbook as the Cattleya Alliance. A few of the more common hybrids in this alliance are Sophrolaeliocattleya (abbreviated Sic), Brassolaeliocattleya (Blc), Sophrocattleya (Sc. ), Cattleytonia (Ctna.) and Potinara (Pot.). Occasionally members bench sophrolaelias in the Cattleya Alliance, but Sophrolaelia contains no Cattleya in its breeding, and therefore sophrolaelias should be benched in the class for Any Other Hybrid. 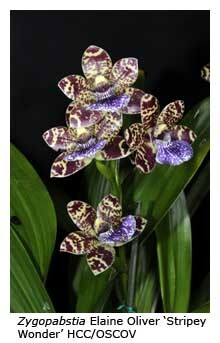 The genus Zygopetalum is also capable of forming intergeneric hybrids with a number of related genera, such as Pabstia (formerly known as Colax), Promenaea, Neogardneria and Aganisia. These are judged together by the OSCOV Panel under the umbrella of the Zygopetalum Alliance. Among the more common are Zygocolax (Zcx., Zygopetalum x Colax), Propetalum (Pptm., Promenaea x Zygopetalum), Zygoneria (Zygopetalum x Neogardneria) and Hamelwellsara (Hmwsa., Aganisia x Batemannia x Otostylis x Zygosepalum x Zygopetalum). The Masdevallia Alliance includes hybrids between Masdevallia, Dracula and related genera such as Porroglossum. Dracuvallia (Drvla., Dracula x Masdevallia) is the most common. Many other orchid genera are capable of forming intergeneric hybrids, although in some instances, probably because of genetic disparities, the seed is not particularly fertile, and only a few seedlings germinate. Where only a few plants result, they are sometimes mass-produced for sale by subsequent tissue culture. 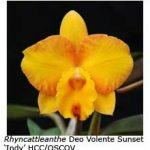 Ray Clement, in a recent article in the Australian Orchid Review, described a number of Australian intergeneric hybrids that he and others had mericloned for sale. 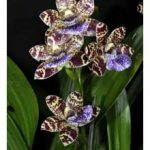 The list included Sartylis Bravehart (Sarcochilus Fitzhart x Rhynchostylis gigantea), Sarconopsis Rita Anderson (Sarcochilus Lois x Phalaenopsis rosenstromii) and Porterara Blue Boy (Sartylis Blue Knob x Vanda coerulea). Strictly speaking, only the second of these three hybrids is an Australian native hybrid, because (according to OSCOV rules) both parents must be Australian natives for the hybrid between them to be judged as such.